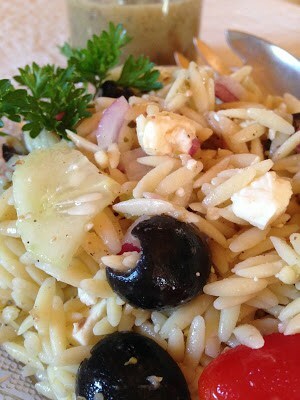 Greek Orzo Salad is a great summertime or anytime salad. This salad is made with orzo pasta, marinated artichoke hearts, black olives, cherry tomatoes, sliced cucumbers, sliced red onions, feta cheese and a bottled Greek salad dressing. 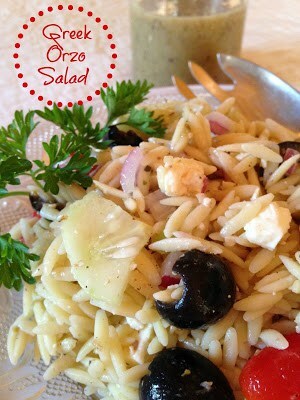 Greek Orzo Salad is fast and easy to prepare when using convenient supermarket ingredients. This salad is ready to bring to a picnic in under and hour. The classic green goddess dressing is a blend of mayonnaise, tarragon vinegar, anchovies, parsley, chives, tarragon, scallions and garlic. In addition to dressing salads, green goddess dressing is often used as a sauce for fish and shellfish. 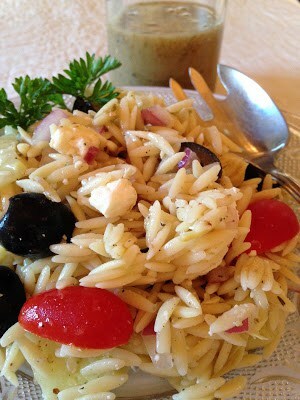 Orzo [OHR-zoh] is Italian for “Barley.” Tiny, rice-shaped pasta used in soups, salads or served with sauce. Cook orzo pasta according to package directions. Drain and rinse under cold water. In a large bowl combine all ingredients. Toss together. Cover with plastic wrap. Refrigerate 1 to 2 hours, add more dressing if necessary. For this recipe, we used Mezzetta olives.